Behind the façade of the bumbling upper-class twit, Britain’s right-wing tribune is playing a canny long game. His goal: injecting far-right ideas into the mainstream. 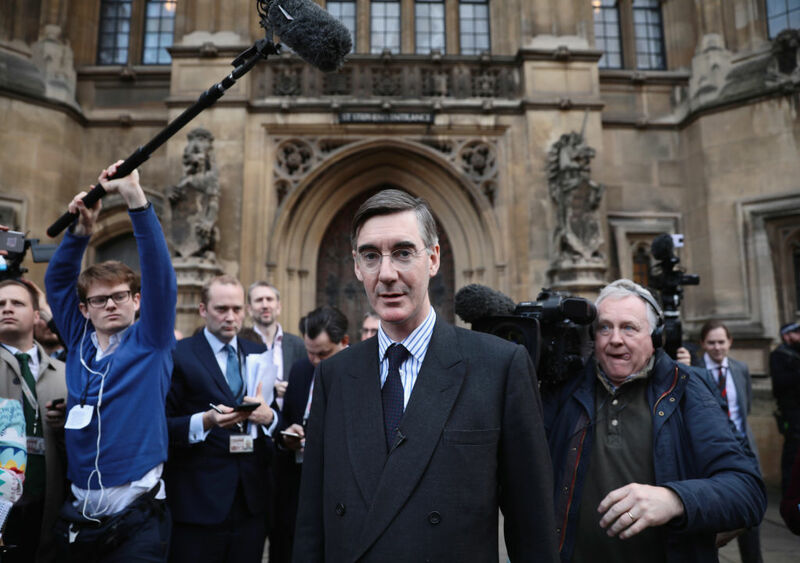 Rees-Mogg’s background is comically elitist: the son of a former Times editor, William Rees-Mogg, he attended the private boarding school Eton, then studied history at Oxford. Rees-Mogg the Younger is fully aware of the class privilege he exudes; indeed, he emphasizes and plays it up: opting for anachronistic outfits, an Instagram account stuffed with photographs of himself in double-breasted suits, or his young children dancing on a Union Jack rug. In parliament and in media interviews, Rees-Mogg appears to have been invented purely to act as a living example of pleonasm: his speeches and remarks are long-winded and reliant on stuffy, antiquated and obscure vocabulary, deliberately obfuscating meaning in an attempt to appear more intelligent than his opponent. What could such a relic then bring to the Conservative party? Like Boris Johnson, Rees-Mogg is aware of the forelock-tugging tendency of many British voters to defer to their social superiors. Many bridle at accents and behaviors like those of Johnson and Rees-Mogg, but many more still perceive them as intelligent and well-educated men by virtue of their educational history, class, and appearance. Both have been touted as possible leaders of the Conservative party if Theresa May is ousted in the immediate aftermath of the Brexit withdrawal. But neither man expects to become prime minister or Conservative leader. Their roles are different — both work to launder messages and perspectives from the far right, pulling them into the mainstream of Conservative thinking. Johnson, for example, was heavily criticized for dogwhistle comments in his Daily Telegraph column comparing women wearing the niqab to “letterboxes,” for which he refused to apologize. Rees-Mogg has led the right of the party since the EU referendum to fight for a “hard Brexit” and against any special terms on the Irish border. He was criticized for speaking at the annual dinner of the far-right Traditional Britain Group in 2013, an organization with links to France’s Front National, which called for deporting black and Asian people from Britain. Challenged on his decision to attend, Rees-Mogg told reporters that while he was fully aware of the group’s views, he did not agree with them himself. Yet his attendance is a tacit decision to support the group, by legitimizing their events with his presence. Class allows both Rees-Mogg and Johnson to propose outlandish right-wing ideas with less fear of repercussion: by playing into the stereotypes of the bumbling but erudite elite gentleman, they provide a necessary psychological distance between the ideas and the man beneath them. When they go too far, they’re merely dismissed as acting eccentrically; if others agree with them, the far-right thinking is whitewashed as mere upper-class fun, packaging it in far more palatable clothing. The messaging of Rees-Mogg rarely differs from that of former UKIP leader Nigel Farage, but they speak to different people: Farage playing into the “man of the people” charade, and Rees-Mogg remaining aloof, playing a caricature of an English toff, and insisting his political stances are the result of both serious intellectual endeavor and straightforward common sense. At first glance, Rees-Mogg appears to be little more than a complex joke: peel away the layers, and it becomes clear he has no plans to become Conservative leader — who would want to when the party and country are in such disarray? Instead, he’s playing a far longer game. As the far right — traditionally found in fringe groups like the British National Party, English Defence League, and recently formed Football Lads Alliance — gains ground in the UK, Rees-Mogg and his fellow travelers are working within the Conservative party to steer it further to the right, undoing David Cameron’s long appeal to the center. For Rees-Mogg, politics remains a low-stakes affair: he has nothing to lose, and a huge mountain of cash to support him should he retire early. That makes him all the more dangerous.